I have quite fallen for eyeliners in the past months. Even though I have probably one of the most difficult eye shapes for makeup, lately you would have rarely seen me without my trusted eyeliner including a small flick gracing the top lash line. It's a wonder this eyeliner thingy, I firmly believe it makes my eyes look bigger and I have in general been embracing more elaborate eye makeup, though I don't in any way presume I have any significant eyeliner or eyeshadow skills. 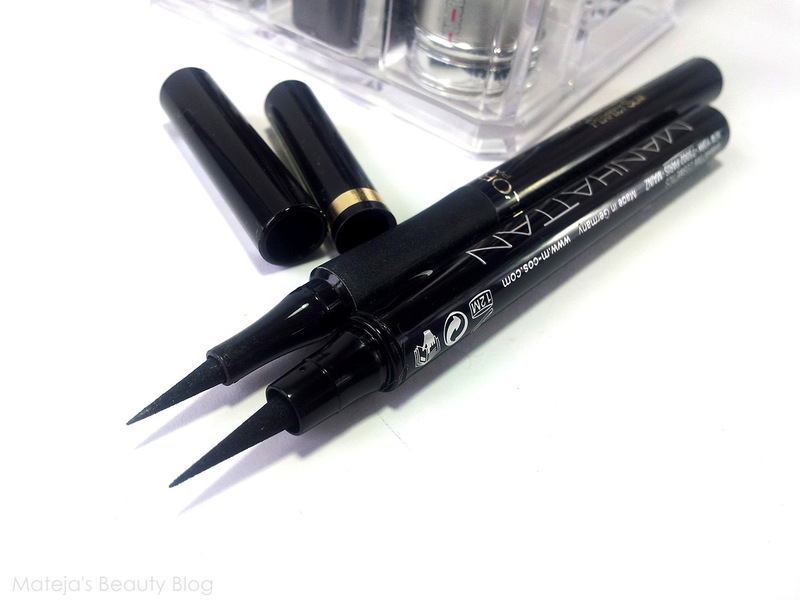 I've owned a fair share of different eyeliners, from regular pencils and gel liners to the most unusual one - Teracotta Khôl from Guerlain, but I have settled on what I find is the easiest and most precise option - felt tip liners. I have two today to compare - L'Oreal's and Manhattan's version, and as you can already see from the top picture they appear very similar, but does that mean they also perform the same? Starting with the general similarities, both have a thin, precise felt tip, they are super easy to apply and are able to create very thin lines as well as a bolder, graphic liner look. And the differences? Well, Manhattan's nib is ever so slightly bigger and thicker, the formula is not quite as black as L'Oreal's and it has poorer staying power. It might not be so apparent from the picture, but Manhattan's is somewhat greyer than L'Oreal's. 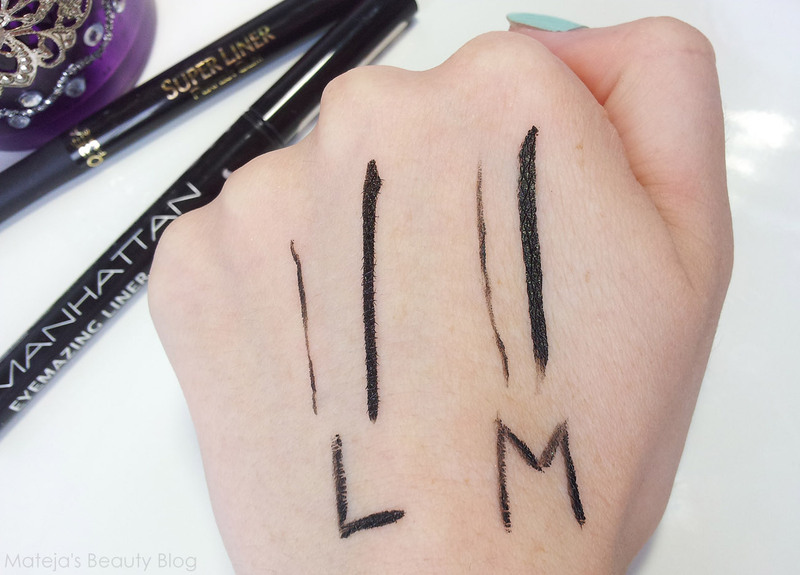 L'Oreal's liner is super black, applies so easily and is very precise. It can manage to last all day, even the flick, but that's all provided your lids are normal/dry and that you don't have a habit of rubbing your eyes. It doesn't really fade though the day and it stays intense. The tip of the eyeliner stays saturated for at least 4 months and on my old liner the base of the nib still has plenty of colour after 7 months of very frequent use. 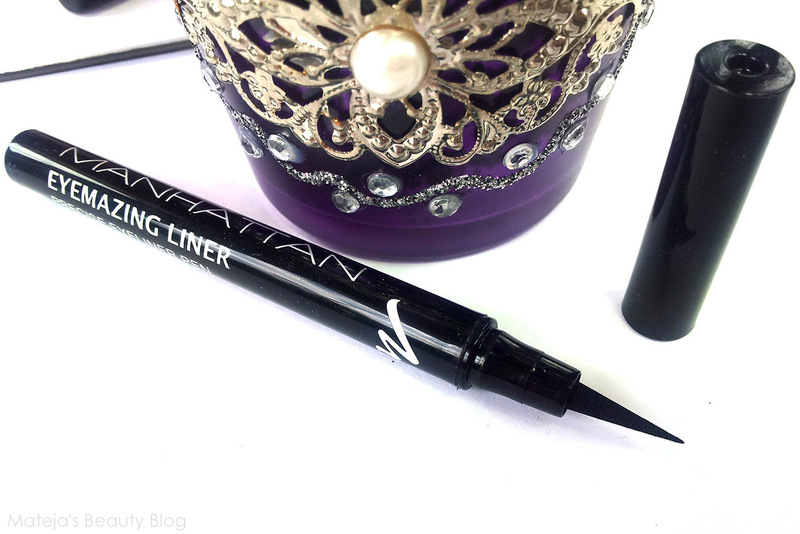 Manhattan's Eyemazing liner (how clever is the name?! I love it) is very similar to L'Oreal's in terms of application - it's easy to use and allows a high level of precision. However, there are a few differences - for one, it's not as black. It also doesn't quite manage to last as long as L'Oreal's and the flick is the first thing to go. It loses a bit of intensity during the day or it can even fade on random spots. My biggest issue with Manhattan's liner is how fast it dries out. I've only purchased mine about a month and a half ago and the tip is not as saturated with ink as it should be or at least compared to the L'Oreal's. My old L'Oreal's one, which I purchased seven months ago, still has more ink in its tip than Manhattan's currently does. Both were stored upside down to allow the ink to seep freely towards the tip, but somehow Manhattan's just isn't saturated enough. I can do the main line above the eye with the middle of the applicator, but when it comes to the flick, it barely manages to do one. When new, you'll barely notice a difference between the two in terms of application as the similar shape of the nib allows a high level of precision. However, Manhattan's is less black, has poorer staying power and dries out way to fast, so for that euro or two of price difference, I'd still pick L'Oreal's every time. In fact, I already repurchased it. One last thing to report is that both of these can transfer in the crease during the day if your lids are oily, so in that case I would suggest a primer or at least translucent powder under it. 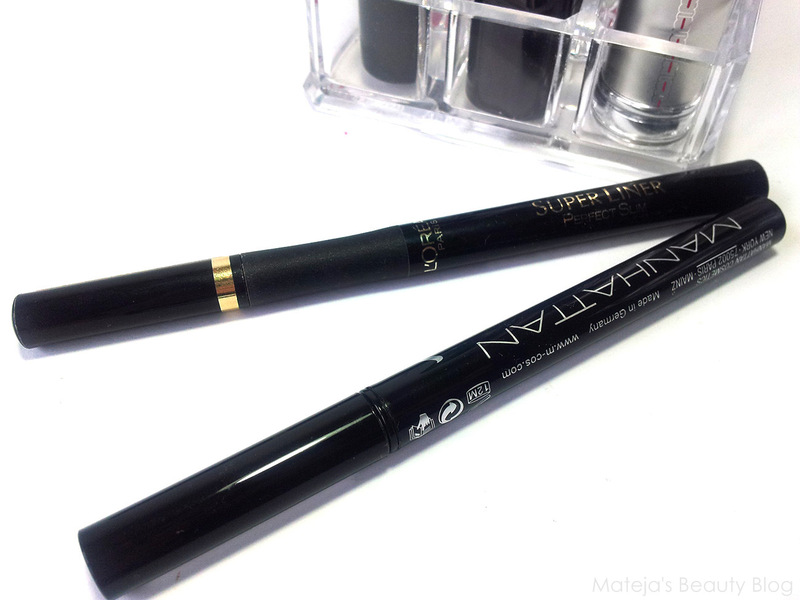 You can get L'Oreal's Super Liner in some drugstores (7.99 €), for those who live in a country where it's not sold, there is always Feel Unique (9.09 €). Slovene's can get it on Salma (5.60 €). Manhattan's is sold in DMs and Müllers for 5.99 €. Thank you for bearing with my poor eyeliner skills, but I like reviews like that - the ones that aren't über perfect as it makes them more real and more average-consumer-like. L'orealov je vsekakor očitni zmagovalec tukaj. :) Bom ga morala enkrat preizkusiti, ko porabim zalogo eyelinerjev, ki jo imam. 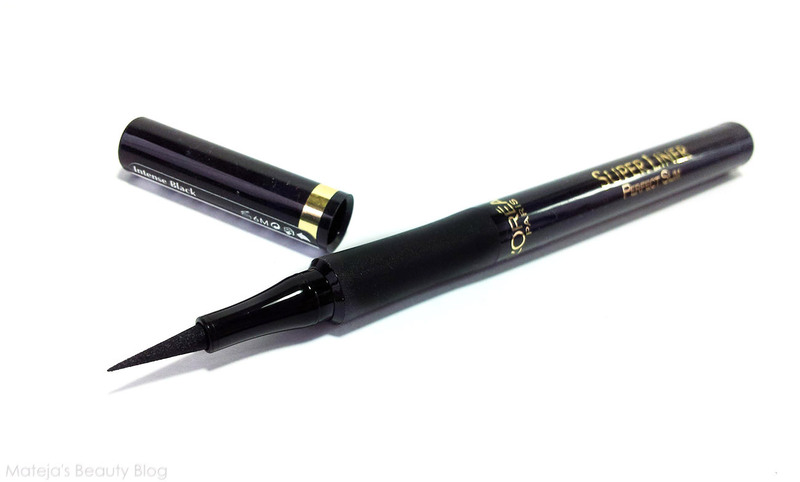 I love the sound and look of the Loreal super liner, think i need to go and purchase! Mislim, da so tvoje skills popolnoma vredu. Jaz tudi ne maram tiste perfektne linije, ker jo dosežeš samo z aplikacijo, ki traja vsaj pol ure in potem je rezultat trikrat bolj debela črta kot je bila v načrtu:) V glavnem, res ti zelo lepo paše liner;). Mi je zelo všeč odtenek L'Orealovega in sam sistem svinčnika je itak odličen, škoda da ni bolj obstojen. Bi rekla, da je L'Oreal Super Liner Ultra Precision bolj obstojen? Ker ta na meni ostane popolnoma enak skoz cel dan. Hvala :D Saj tako po pravici povedano, mi je moj način linerja zelo všeč in meni izgleda super v živo, ampak na slikah vedno izgleda veliko slabše. Mogoče je samo moj fotoaparat čuden, ker tudi senčil sploh ne slika dobro ali je pa pač moja oblika oči nefotogenična. Meni se zdita obe L'Orealovi verziji enako obstojni, tudi formula se po mojih izkušnjah praktično ne razlikuje :) Na meni Perfect Slim zdrži cel dan, ker imam nimam mastnih vek, Manhattanov pa ni tako dober. Je pa najbolj obstojen liner kar sem jih sprobala ta novi Maybellinov - ta stvar je vodoporna in tudi če si manem oči je še vedno gor. Ni pa tako enostaven za uporabo kot L'Orealov, niti tako natančen ne. 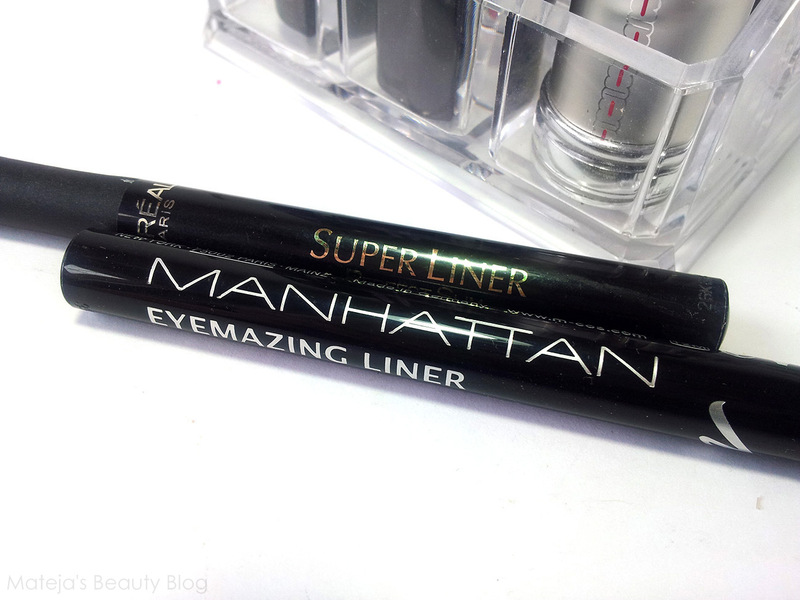 I don't get how you get the L'oreal Super Liner to last that long, when i used it i guess it was as you described Manhattan's, but it must be different from person to person. Thanks for the review! 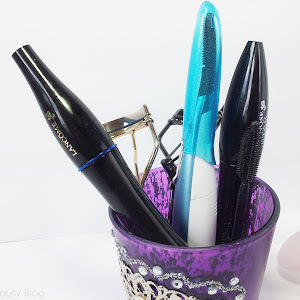 I'm new to the liquid liner world, I usually use a Bobbi Brown one, but I want to check the L'oreal one out for sure because it is cheaper! Jaz ko sem na kakšni sliki vidim na kateri sem brez linerja, si takoj rečem - you need more eye makeup :) Zdi se mi da izgledam utrujeno brez njega, pa čeprav dovolj spim.